In parts 1 and 2, state whether the petition is for a person or a person AND property. In part 2, check all of the boxes that indicate why the guardianship is necessary. In parts 3 through 9, provide information about the minor. Apart from their full legal name and date of birth, you need their mailing address and the address of their current residence. In part 6, provide information about the person who now has custody of the child. In part 7, provide information about the child’s former places of residence. Check the appropriate boxes in parts 8 and 9. In parts 10 through 13, provide information about the minor’s parents. You’ll need to provide their full legal name, date of birth, address, and telephone number. If either parent is deceased, provide a death certificate. If either parent cannot be located, provide efforts that have been taken to locate the parent. In parts 14 through 21, provide information about the proposed guardian. The petitioner needs to provide name, date of birth, relationship to the minor, employer information, address, and telephone number of the guardian and possible co-guardian. If there are any pending proceedings, check the appropriate boxes in part 16. Parts 17 through 19 also apply to proceedings and address child support and visitation orders. Part 20 asks the petitioner if they’ve ever been part or witnessed litigation for the custody of the child in this state or another state. 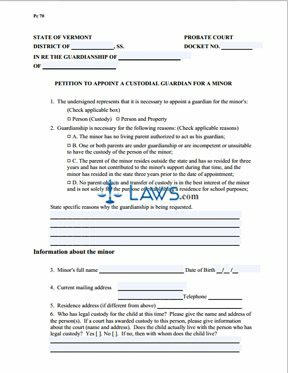 The petitioner needs to sign the form in front of Notary Public.